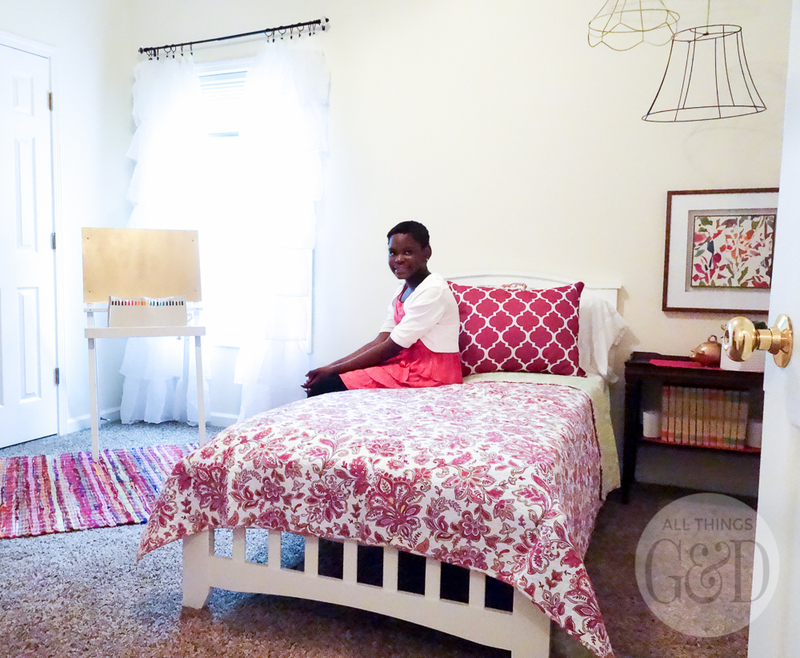 Yassine is a lovely 11 year old little girl with a beautiful bright smile that would melt your heart, and it was such joy to create a new bedroom for her as part of GMC’s Hidden Treasure Adventure! In case you missed it, GMC invited 8 bloggers on a “Hidden Treasure Adventure” (#GMCHTA) to furnish and decorate a Habitat for Humanity house for a deserving family in Atlanta, Georgia. We were each given $285 in cash to shop the World’s Longest Yard Sale for items we could use to furnish our spaces. 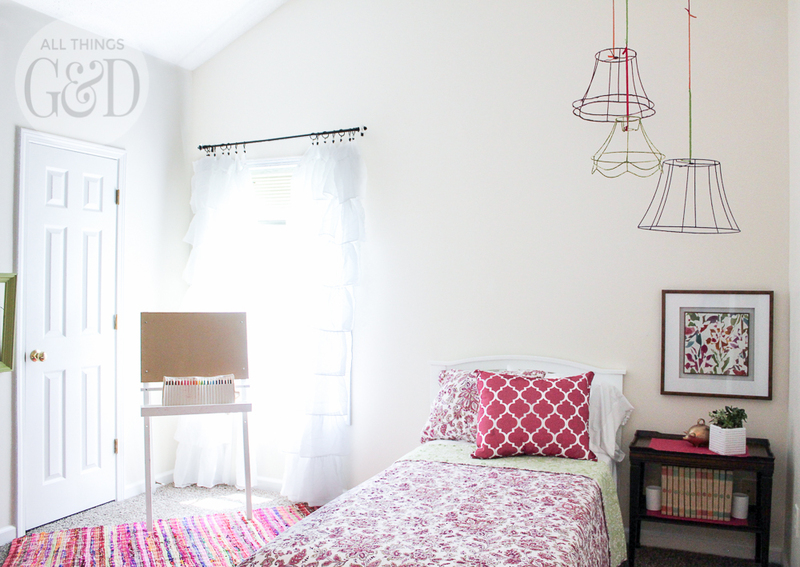 I was assigned Yassine’s room, and had so much fun pulling it together for her! The little bio I received on Yassine informed me she likes pink, purple, drawing, painting, swimming and gymnastics. After two days of shopping we had about 24 hours to turn the “hidden treasures” we found along the World’s Longest Yard Sale into gems and put our rooms together. Thankfully, I had a lot of coffee and a lot of help, because I had a ton of work to do! A little bit of painting in Yassine’s room, and a TON of it in the hotel conference room. Let’s start with the dresser. I was hoping to find one that didn’t need any refinishing, but no such luck. I purchased this little diamond in the rough somewhere in Kentucky for $30. 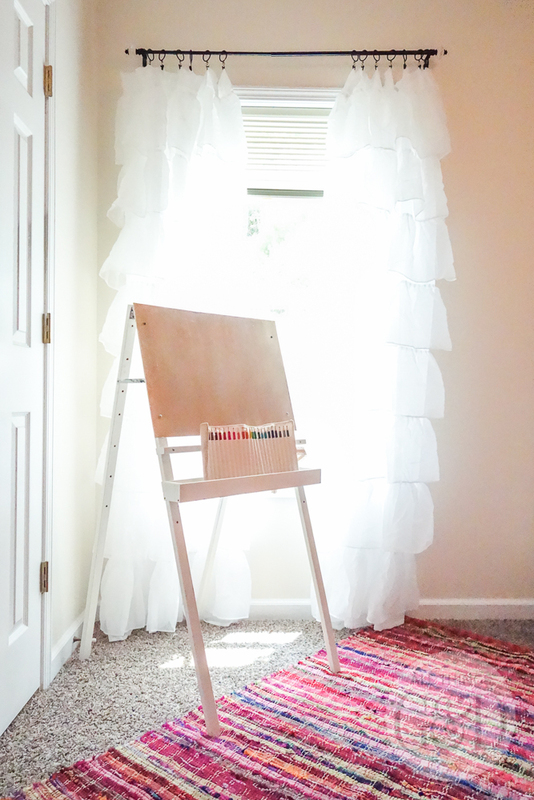 It was the most time consuming DIY in Yassine’s room, but it turned out beautifully. 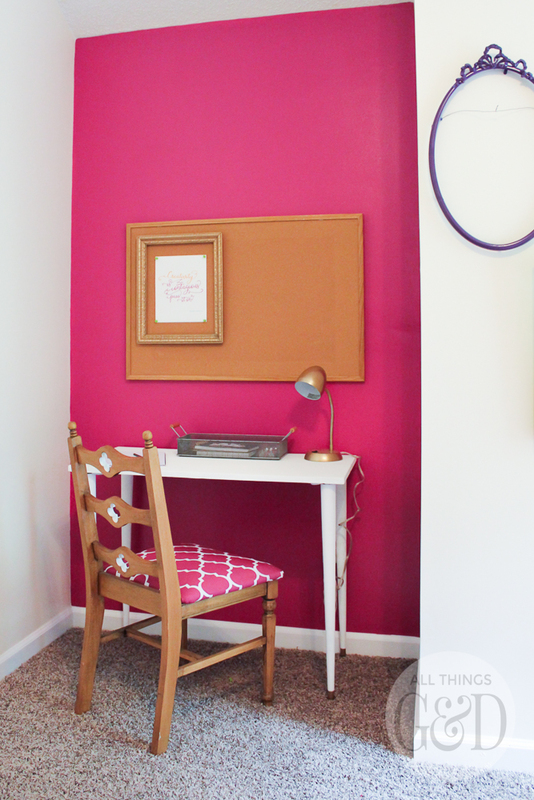 Brooke from All Things Thrifty helped me out by priming it while I was working on other things, and then I finished it off with three coats of the same semi-gloss enamel paint I used on the accent wall in Yassine’s room. The hardware got a little facelift with some gold spray paint, and by the end she looked as good as new! When I first saw this chain link fence gate along the World’s Longest Yard Sale I knew instantly what to do with it! 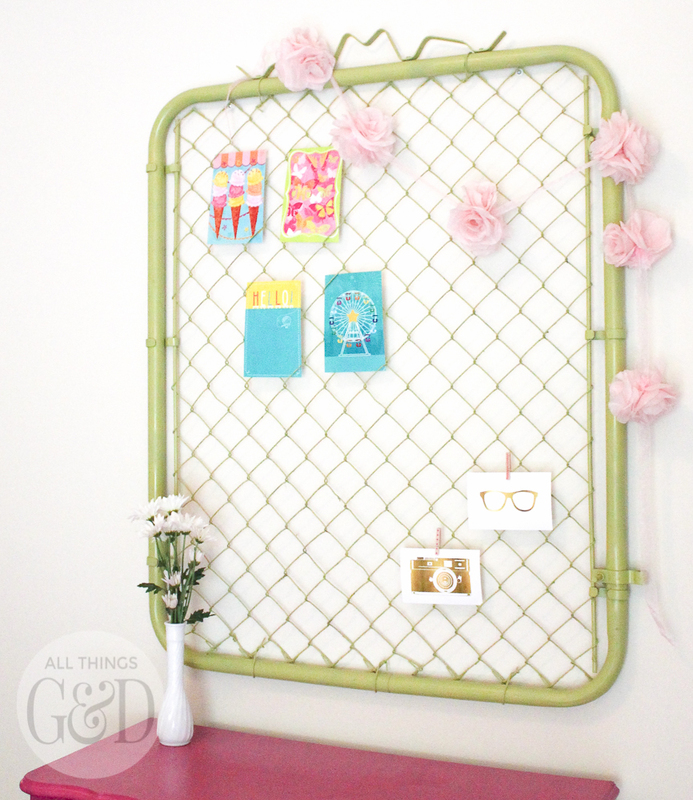 Spray painted green (thanks to Brooke and Michael from Inspired by Charm for taking this over during my time crunch) and hung on the wall it makes a fun holder for cards, photos and jewelry. Cards and photos can be tucked into the diamonds of the gate or (along with jewelry) clipped on with decorative clothespins. 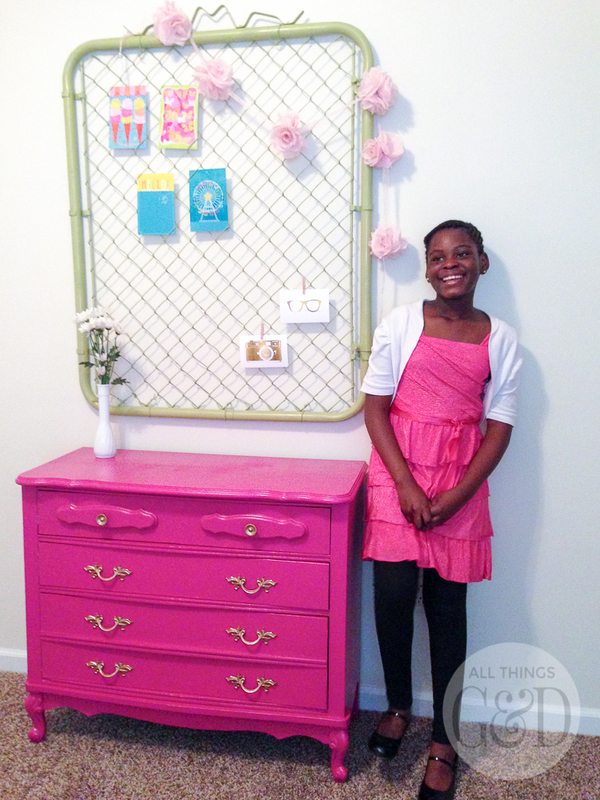 Chain link fence gate repurposed as a wall organizer. The side table I purchased to use as Yassine’s desk ($12) was already in great shape. It just needed a little sanding (which Ashley from Simply Designing handled) and a couple of coats of chalk paint (a group effort by myself, Brooke and Allison from Two Thirty-Five Designs). To finish it off, I spray painted the metal hardware at the bottom of the legs gold. This desk chair ($10) is one of my favorite pieces in the room. I unscrewed the seat cushion and recovered it with excess fabric from the decorative pillow on Yassine’s bed (it was originally a body pillow that I cut in half) – such a simple update! 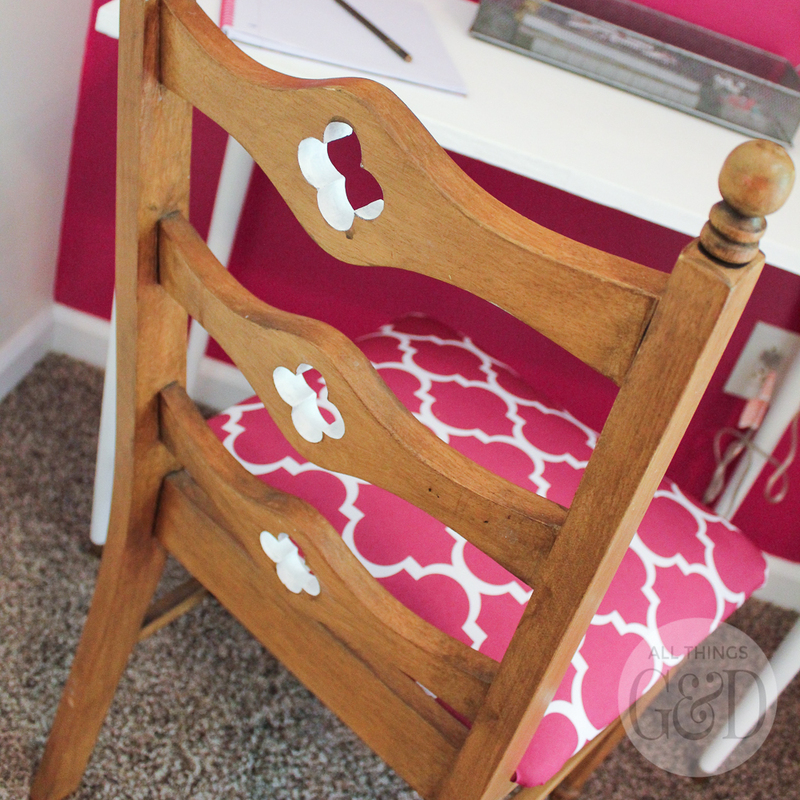 I loved the way the clover cut outs in the back of the chair complimented the pattern on the fabric, so to play that up I painted the insides of the cut outs with the same white chalk paint I used on the desk. I topped Yassine’s desk with a task lamp ($.50) that I spray painted gold, notebooks, and a basket to hold pens, pads, and pushpins. 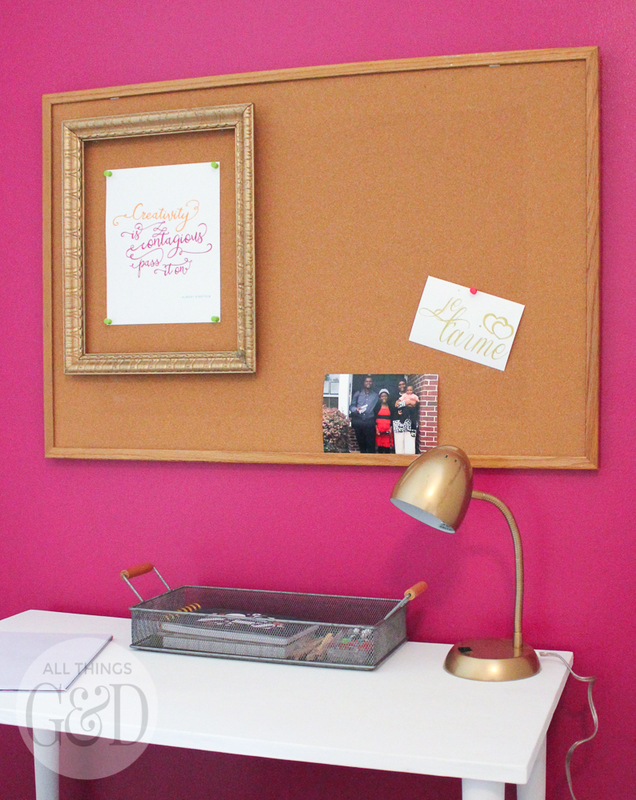 I hung the bulletin board ($1.50) above her desk and got it started with an empty frame (free) spray painted gold, a family photograph, and some cute printables that Brooke found and had printed for me. 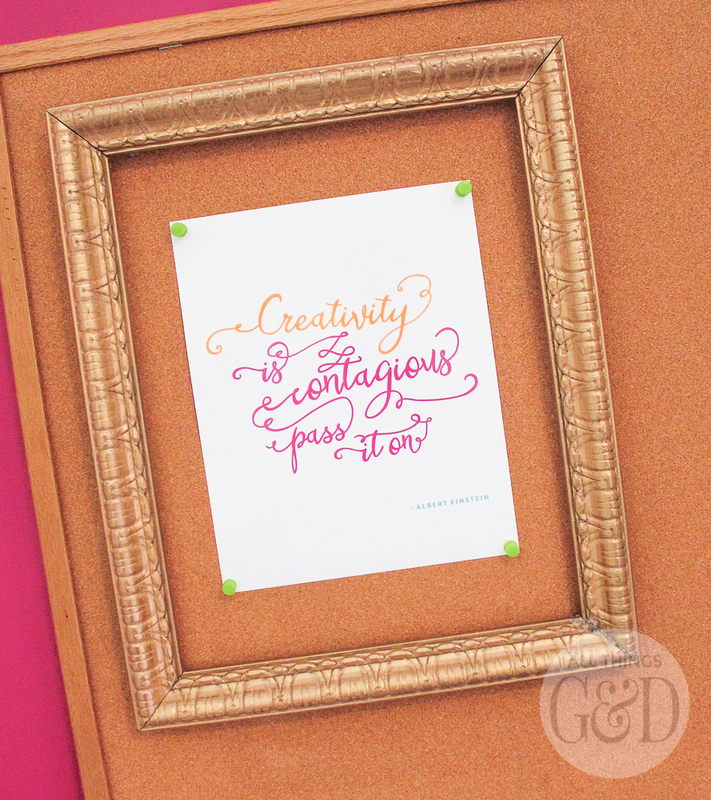 The “creativity is contagious” print is from Upcycled Treasures and the “je t’aime” print (above) is from Penny Jane Design. French is the official language of Ivory Coast, Africa (where Yassine and her family are from) which makes it so fitting. This easel ($2) was so sad and beat up when I found it (before picture here) but a little TLC had it looking better than new. It was originally two sided with a chalkboard on the back, but the entire unit was missing screws and the chalkboard panel was warped, so I removed it and used its screws to properly secure everything on the front, making the easel one-sided. A few coats of white chalk paint for the frame (another group effort by myself, Megan from GMC, Allison and Brooke) plus gold spray paint for a little sparkle, and it was ready for Yassine’s next masterpiece! Remember those wire lampshade frames? I envisioned using them as a grown up girl’s version of a mobile and they ended up looking even better than I expected! When we first arrived at the house I discovered Yassine’s bedroom ceiling was vaulted, so these became a great way to fill up some of that vertical space. 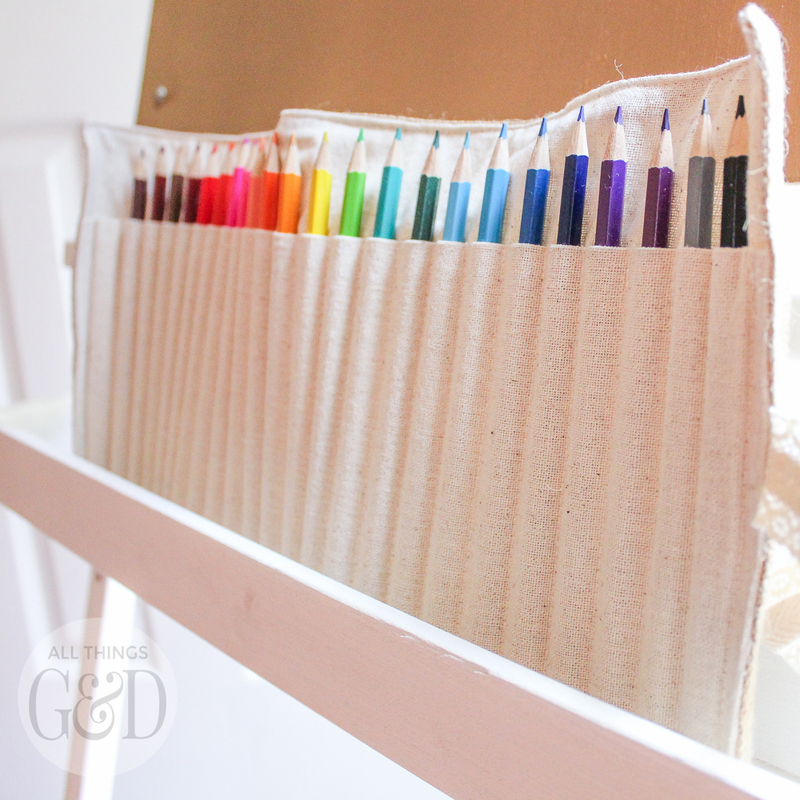 I spray painted the shades pink, purple and green, and used a few different colors of grosgrain ribbon knotted together to hang them, adding a bit more pop of color in this corner. 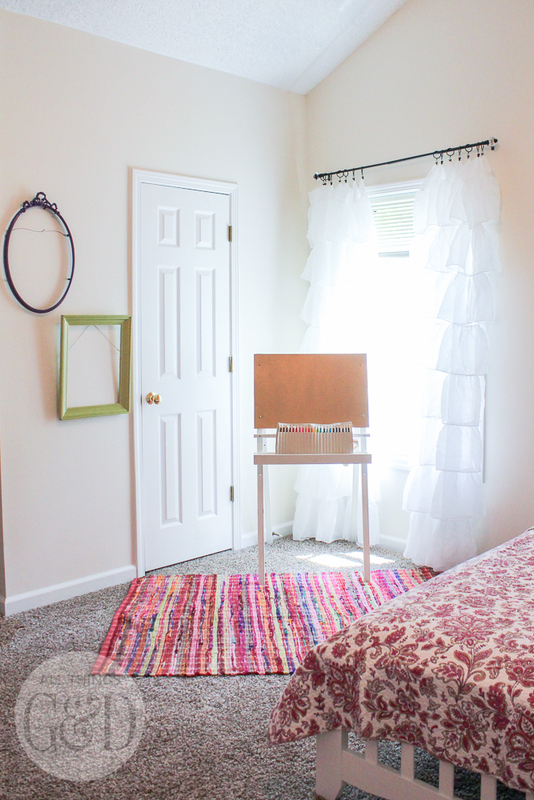 This cute little accent table ($5) makes a perfect night stand, and here’s a look at the vintage set of My Book House books Brooke found along the World’s Longest Yard Sale. I purchased them for $2 and later discovered they’re worth more than $300! Michael (who was in charge of the little boy’s bedroom) and I decided to put matching piggy banks in each kid’s room. 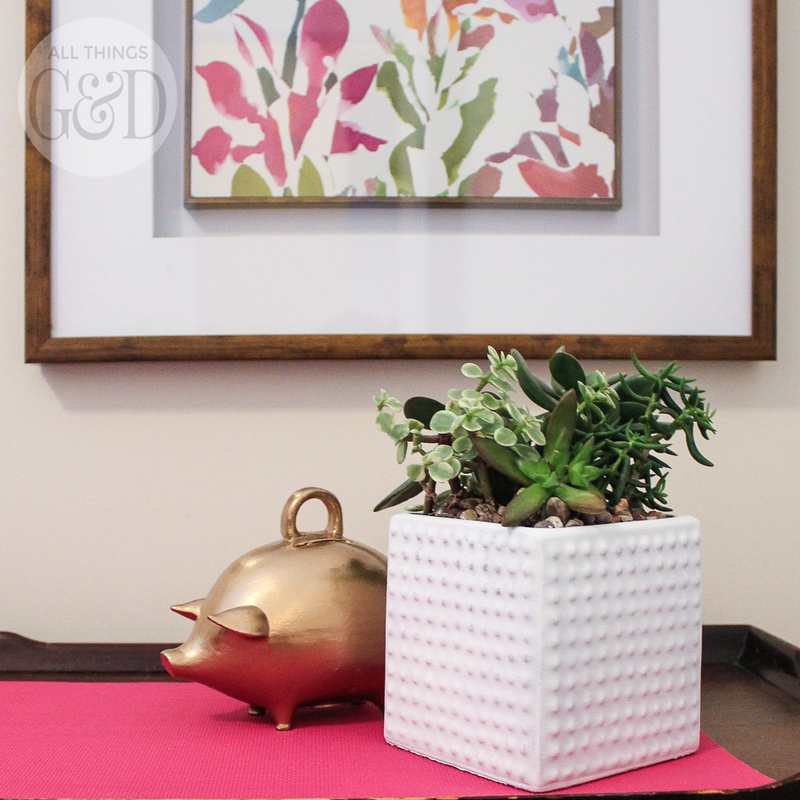 Here is Yassine’s ($2) spray painted gold, and you can see her little brother’s matching bank in Michael’s room reveal post – the whole room looks incredible! 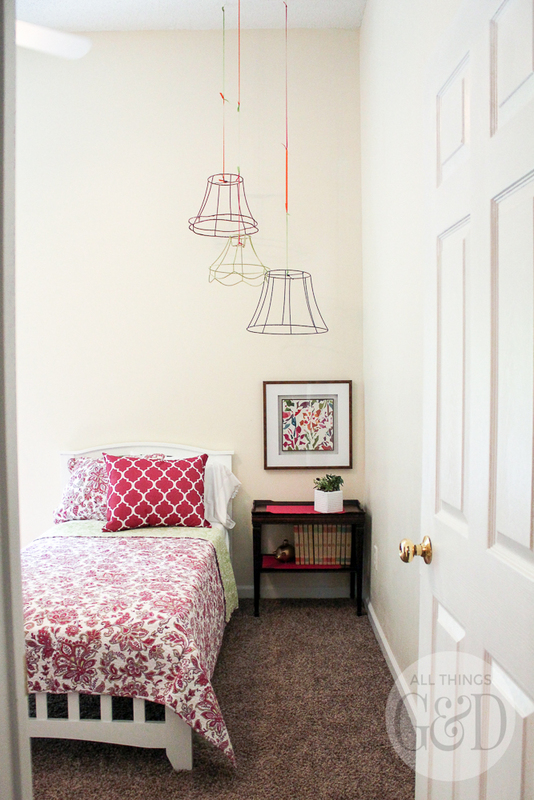 I was overjoyed that Yassine loved her bedroom! It didn’t take long before she was bouncing on her bed and excitedly showing her cousins her new things. 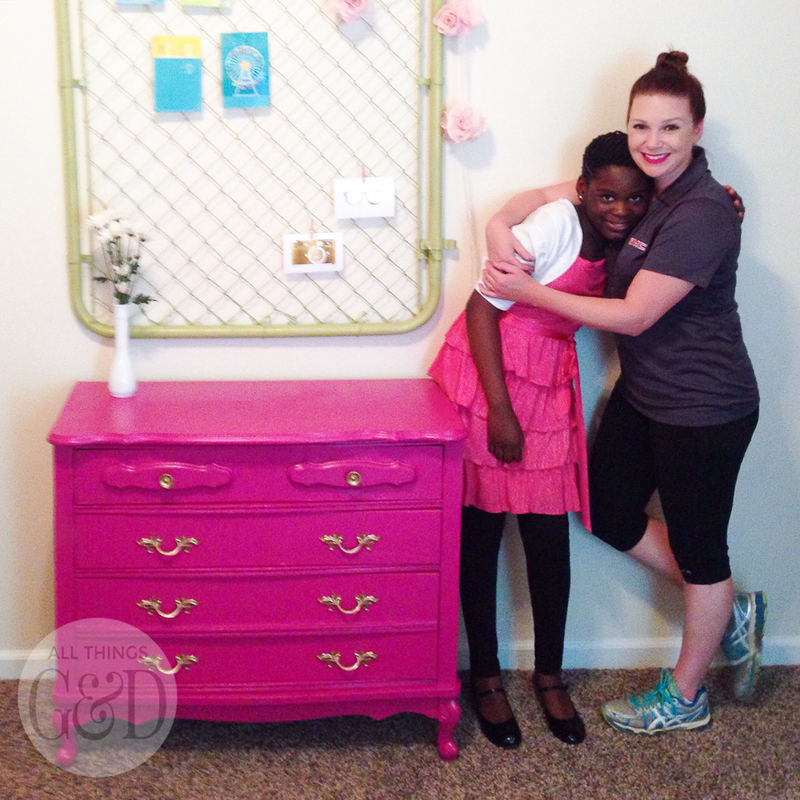 At one point she exclaimed, “I can’t believe this is my bedroom!” and I had to fight back the tears. Yassine seeing her room for the first time. When I asked to get a picture with Yassine in her new bedroom she surprised me by leaning in, laying her head on my shoulder and giving me a little snuggle. It was such a sweet and loving gesture that I couldn’t hold back the tears any longer. I’ll be sharing the hallway bathroom I also decked out for the family as well as the rest of the Habitat for Humanity house we designed and furnished in my next GMC Hidden Treasure Adventure post, coming soon! 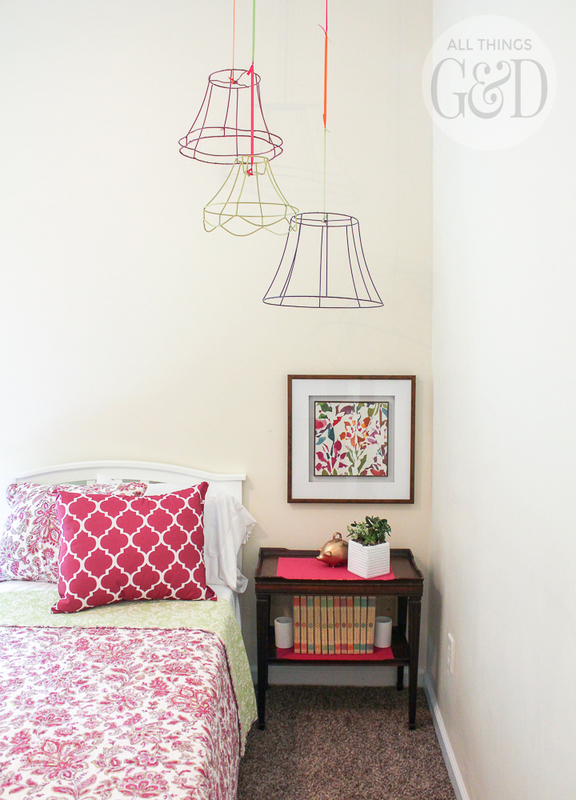 In the meantime, how do you think Yassine’s room turned out? What’s your favorite yard sale redux? Dusty, what a fabulous room! So vibrant and happy to match Yassine’s smile! My fav is those lamp shades…BRILLIANT! 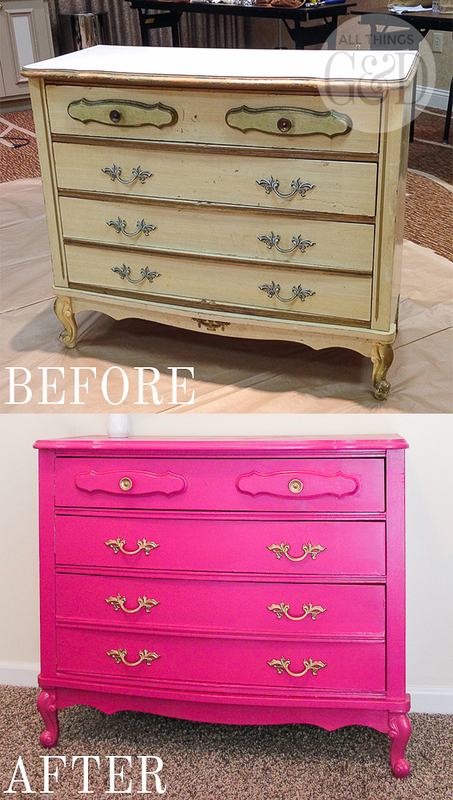 And that pink dresser is phenomenal! Whoohoo! Congrats! Thank you so much, Sue! The lampshades were such a fun find, and I’m giddy with how great the dresser turned out. Thank you so much for following along and your willingness to help us out with finds along the way! So sweet of you. The room turned out beautiful. I love the lampshades! My favorite thing is that you didn’t overload the room with accessories and left her plenty of room to add her own personal things to truly make it her space. What shock it must be to move to a whole new country at that age and you gave her a haven. 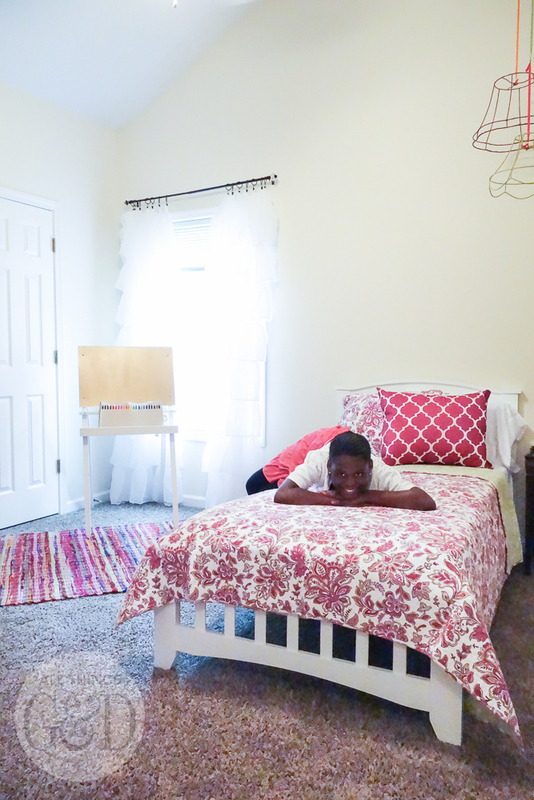 Although nothing we can say about the room can even come close to the smile on her face – that says it all about how your room redo turned out. Thank you so much, Kim! I would love to see how everything looks after Yassine adds her own personal flair to the space – I’m sure it will be so fun! 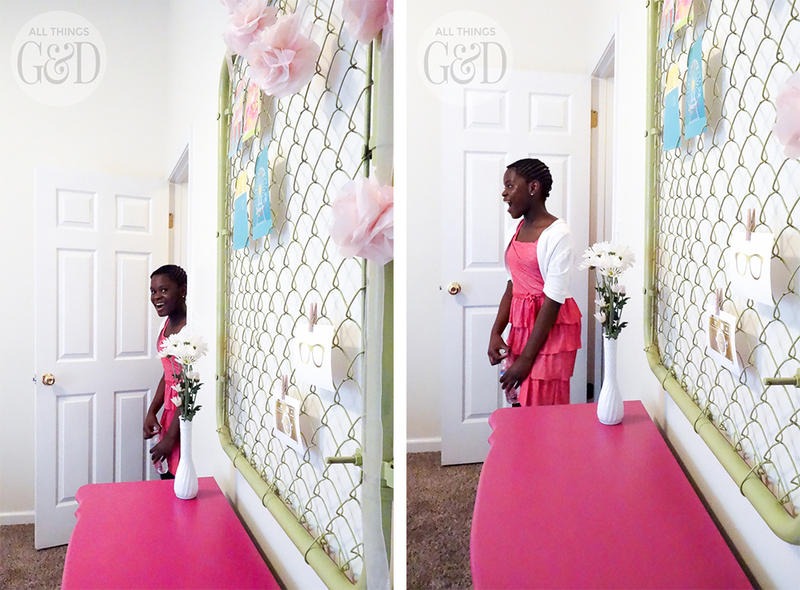 It was incredibly rewarding and heartwarming to see how much Yassine loves her room. Makes me want to do this sort of thing every day! So very sophisticated and girly at the same time. I love the rug. Did you find it also?? Thank you so much, Vicky! I found the rug at Ross for $15. Such a steal! 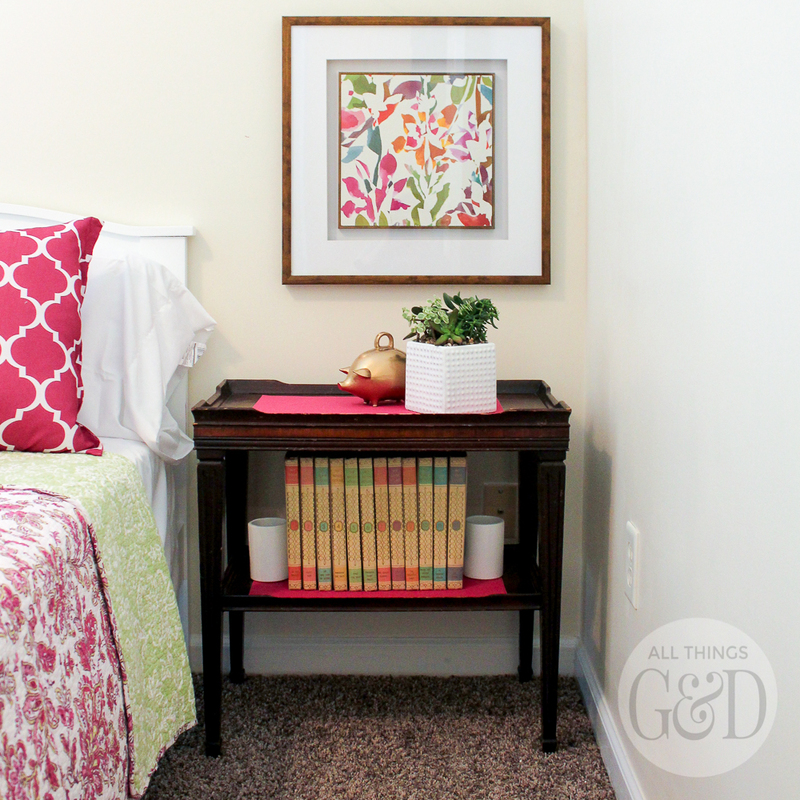 Perfect balance of color and definitely a room that will grow with her! Great job! So sweet of you to say, Ashley – thank you! I work at Habitat for Humanity DeKalb in Family Resources. I was on vacation when you were in town and saw the home in person today for the first time. Breathtaking! You did such a perfect job on Yassine’s room. When we first viewed the house a few months ago, Yassine picked her bedroom and said she wanted a desk right where you put it. Your design ideas and special touches are so appreciated! Thank you so much, Kate! I am so touched by your kind words. And so thrilled that Yassine loves her new bedroom. 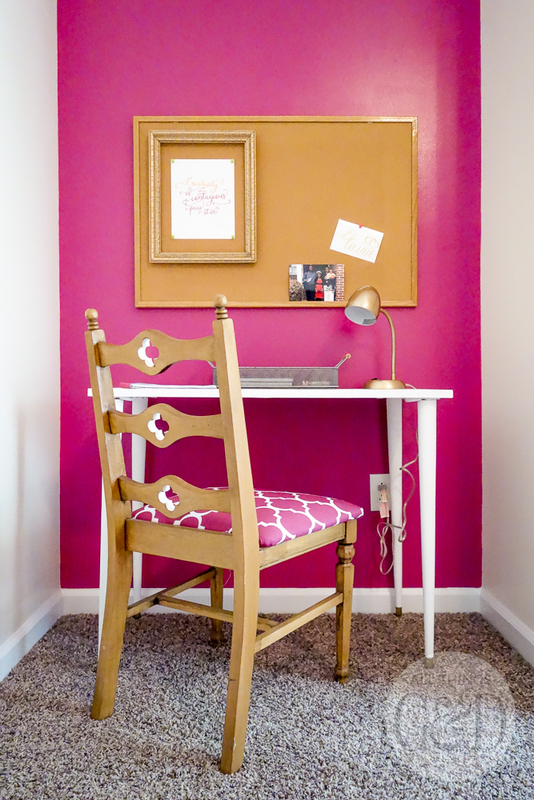 I’m glad we had the same idea for a desk in that spot – so fun to hear!